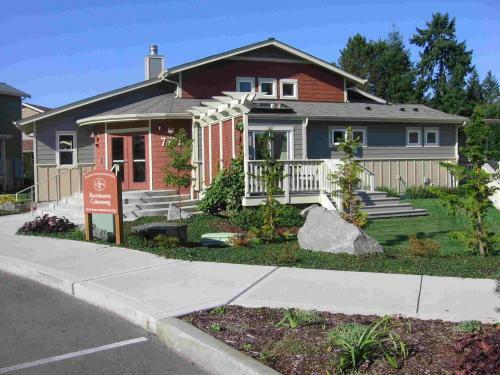 This distinctive condominium cohousing neighborhood near Bremerton, Washington, offers quality reasonably-priced living an hour away by ferry from Seattle. Meadow Wood is reminiscent of a New England village, nestled in a gently sloping pasture, bordered by a creek, surrounded by tall trees and nature trails. Yet it is located on a bus line and is less than 10 minutes from the Bremerton and Silverdale urban centers. The layout of the site balances a desire for personal privacy with the social dynamics of a friendly, inter-generational community. We’re dedicated to bringing out the best in each other, through active listening, mutual respect, an appreciation of differences, and honest caring. Community decisions are made by consensus. There is no single leader, no pooled income, or other required communal practices. Residents either own their units, or rent from others who do. We are committed to an equitable stewardship of the land and resources, with a commitment to uphold the dignity of each person.